Herning has transformed a green area into a water park, which both collects rainwater and acts as a recreational nature experience for citizens to enjoy. With this project, Herning Municipality has demonstrated a good example of how to handle an expected increase in rainwater, while improving existing green areas that otherwise go unused. The municipality has thus increased the value of a desolate area. The lake is located between two districts and is ideal for both outdoor recreation and efficient green/blue climate adaptation. 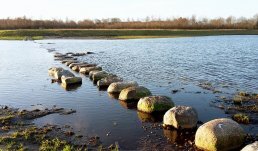 By creating the lake which can store 60,000 m3 of water, Herning Municipality has reduced the water level in nearby streams by up to 30 cm, lowering the flood risk in both Herning and Holstebro Municipalities. The municipality has also set up an interactive climate bar where visitors can record their observations on plant and animal life, and take readings of current climate data such as precipitation, water levels and temperature. From the lake’s construction, excavated soil has been used to build playground hills, which can be used for everything from mountain biking to tobogganing in winter. Different open spaces across the area are available for picnics, while shelters are available for campers to stay overnight. Lillelund Engpark lake invites visitors into the blue and green landscape for outdoor activities, exercise, teaching and more. The project encourages movement and exercise year-round. Visitors can take a trip around the lake on the "Heart Path", created in collaboration with the local Heart Association Committee in Herning. When extreme rain events flood the sewers, the wetlands become polluted with sewage. The lake in Herning Municipality will help reduce the risk of floods and, with it, pollution. The new lake increases resilience against climate change by protecting the city against the increasing amount of rainwater expected in the future. Herning municipality is a municipality on the Jutland peninsula in western Denmark.